Public Skateboarding? Good or Bad? Since looking at free running I have been considering other forms of sporting activities that could occur in a public space. Skateboarders and BMX riders instantly came to mind. The Bench below has been specifically designed to prevent skate boarding. Although the bench is beautiful I cant help but dislike the idea that its purpose is to prevent something that can bring joy to so many. 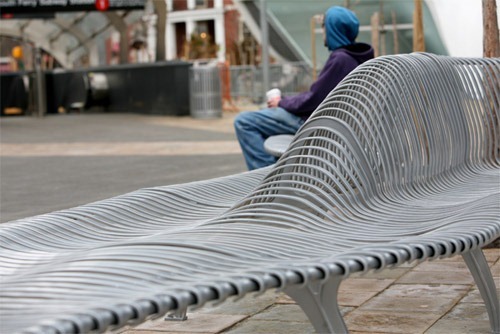 The bench is called the Zipper Bench and is by WXY Architecture + Urban Design. The bench in the image below does the exact opposite of that above. Its purpose is to aid grinding. Its form is simple, elegant and purposeful. In my study of Architecture a key idea that was often engaged was that of an ‘active frontage’. 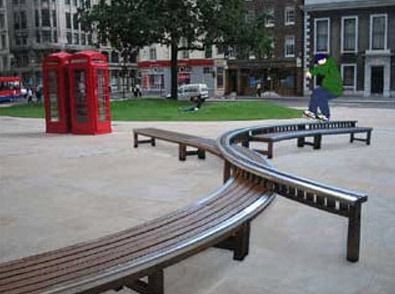 The idea was to create a self policing space by surrounding a space with functions or activities. By surrounding the bench below with activities the use of the bench in the middle should be limited to non-threatening pursuits. Groups of kids hanging around and vandalising the area should be reduced. Instead people are given a space to gather and have fun with the urban sports they enjoy, but as they are surrounded by other people going about their everyday lives they should be less inclined to misbehave.